Let’s get the obvious out of the way: Coachella is JUST as much about fashion as it is about music these days. If you were able to score some tix, you’re probably going to spend even more on your outfits as you are on the tickets themselves (unless you shop with your UNiDAYS discount, ahhhhhbviously). And let’s be real- some Coachella fashion can be... shall we say…questionable. But LOTS of it totally hits the mark! So I’m here to help you dress for Coachella without looking like some sort of unbathed fairy-pirate-unicorn. Vanessa Hudgens vibes ONLY. It started in the medieval era...then reappeared in the ‘70s...then again in the early 2000s….and now it’s back! Not only is the bell sleeve cute and springy, but on a hot day in the sun, you can let your arms breathe! There are a few ways to do this...a nice crop top, a cute tie-front shawl, or if you want to do it the BB Dakota way, a nice sundress. Bodysuits are the best because you can do ANYTHING with them. Under a skirt, under jeans, over tights, under a belt, over NOTHING, under NOTHING…….the list goes on. I personally LOVE the belted bodysuit look. It’s like a cool ‘80s workout video star. If you add some chain detail (see Nasty Gal's version below) you can make it edgy and modern. If you feel over-exposed in just the suit, add some denim cutoffs, track shorts, or a denim skirt over it! PSA: I do NOT condone a repeat of the Justin/Britney 2001 AMA ensemble. That said….denim on denim CAN work. My personal rule when pairing denims is to make sure they are mismatched. A super light-wash denim jacket over some darker shorts, or even some dyed denim like this SICK cropped light pink jacket from American Eagle. Cropped denim jackets and high waisted shorts is the name of the game!! The deep V floral romper. The beret/newsboy hat. The fanny pack. The retro sunnies. The ‘60s inspired white ankle boots. ALL OF IT. These outfits from Mixology should literally just be directly copied and pasted into Coachella. They’re the perfect blend of 2018 and 1967, which is obviously the vibe at Coachella. Some key takeaways from this outfit: The striped bell-bottom pants, the vintage ruffled bikini top, the wicker bag, the vintage t-shirt, and the western-inspired studded belt. You have two options here: you can raid your parents’ old dusty trunks in the attic, or you can stop by Urban Outfitters with your UNiDAYS discount and NOT have to wash the smell of mothballs out of the clothes first. Fringe, sequins, rainbow tie dye, neon lace, animal prints, serious cowgirl lewks...the Disco Carnival collection by PLT is EVERYTHING. If I had to make one request for those bold enough to rock these looks, it would be ONE THEME AT A TIME. If I see the faux cow skin chaps paired with the rainbow shaggy cardigan, I’m going to be VERY disappointed. Another brilliant way to stay cool under the hot Coachella sun: give your chest some air!!! Tie-front tops are so in, and so easy (just look at this one from Princess Polly). They can be worn alone with shorts, over a minidress, or even with some sick printed leggings (if you have other ideas pls comment and let me know), and it’ll keep you cool in temperature AND in appearance (sorry that was lame). Make sure to have a friend on tie-watch though, especially if it’s windy! There are many different ways to sparkle- whether it’s more of an iridescent shine, a glittery shimmer, or a straight-up bedazzle. No way is superior- all sparkles are created equal (if you’re going to quote me on that in your future memoir, DM me for my trademark info). Boohoo just so happens to do ALL types of glitter PERFECTLY. Coachella is about seeing and being seen, so mix and match with these bad boys! I can’t decide whether I like the iridescent set or the sequin jacket better! We’re at a very special moment in history where denim is no longer JUST denim. It’s a blank canvas on which to add your personal flare. 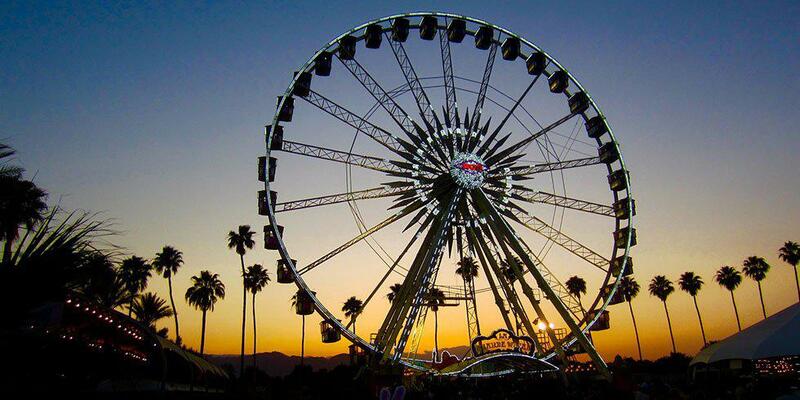 And Coachella is the perfect place to express yourself THROUGH DENIM. This BB Dakota jacket, in all its pearl and fringe glory, is literal Coachella HEAVEN. If you’ve ever read my fashion posts before, you know I’m a sucker for a good matching set, and you BETTER BELIEVE I’m not about to let it go. Thank you Madison Beer for this easy, breezy pinstripe set, which is so perfect for walking around in the sun all day (plus it’s strapless so you won’t get ugly tan lines!). I was skeptical about fanny packs when they first came back, but when they’re black leather with chain strap detailing you CAN’T GO WRONG.